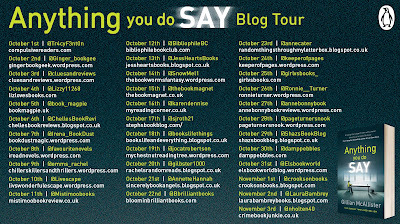 Hello everyone and welcome to my stop on the Anything You Do Say blog tour! I'm thrilled to have a brilliant Q&A with Gillian McAllister to share with you today on writing, what to expect from her latest book and how her life has changed since becoming a Sunday Times bestselling author. 1.) 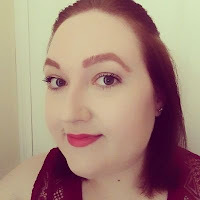 Hi Gillian, welcome to the blog! How has your life changed since becoming a bestselling author after the release of your debut novel Everything but the Truth? Wow, what an interesting question. It’s quite strange and paradoxical. It’s changed in loads of ways and hasn’t changed at all: both are true at once. I still live in the same house, have the same boyfriend, friends, job (I’m a lawyer). On the other hand… I now work part time. That’s been a big change. I see my book in a lot of places – it’s still in all bookshops and was in the supermarkets for ages, too. I get a lot of messages from readers and strangers – several a day. I get a lot of proofs sent to my house to read in advance of their publication (which is awesome). At anything social that’s outside my immediate inner circle, I get a lot of questions about being an author (and being a bestseller), some of which can be slightly awkward and personal or financial in nature… One of the most peculiar things, I think, is having a reputation that precedes you. Not that strangers know who I am when I walk into a room – of course not – but friends of friends and acquaintances often are aware that I am an author when I know nothing about them. 2.) What’s been your best moment as an author so far? God, another great question! I have two: the moment my agent left me a voicemail in February 2016 saying that I should call her. I did, and Penguin had pre-empted my novel. I will remember that moment for the rest of my life; it’s not often you feel so very far from achieving a life ambition, and then, one voicemail later, you achieve it. It was very special. The second is really in the every day nuts and bolts of it: the writing. Sitting in a Starbucks and making things up and knowing it’s my job. Feeling totally in love with a work-in-progress as it nears completion. The dynamite feeling of an idea arriving while you’re brushing your teeth. All of that. 3.) What can fans of Everything but the Truth expect from Anything You Do Say? In what ways are they similar or different? 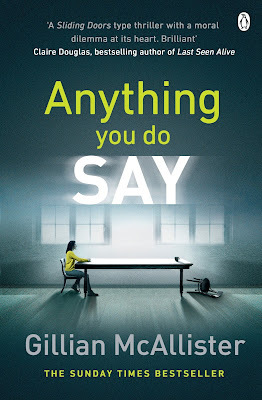 I would say that Anything You Do Say is more of a thriller than Everything but the Truth. While the relationship takes centre-stage in both of them, Anything You Do Say has a denouement and a resolution that stands apart from the marriage between my main protagonists. They both explore morally grey areas, guilt, lies and relationships in turmoil. Both also have medical and legal elements. 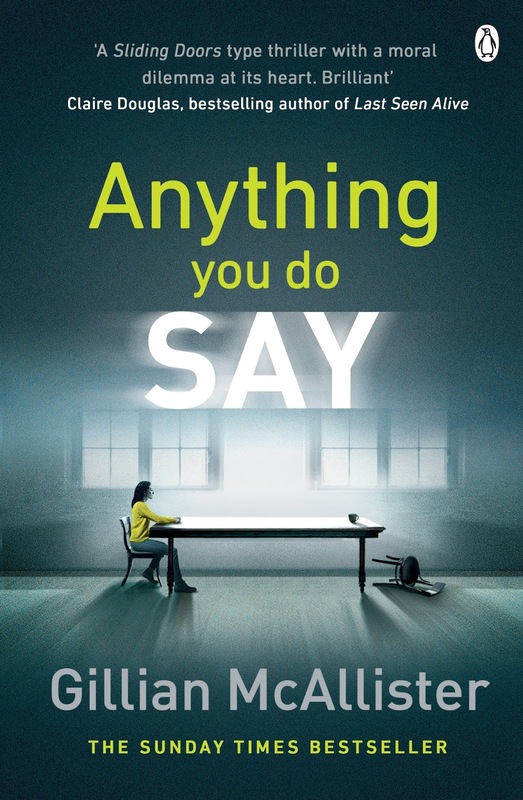 Anything You Do Say is definitely more ambitious – it is two books in one and an unusual structure. 4.) What sparked the idea for Anything You Do Say and what made you decide to tell it in a Sliding Doors narrative structure? I had wanted to write a Sliding Doors novel for ages and had been toying with ideas. I thought about having a woman in an unhappy marriage whose husband does/doesn’t die on the way home from work in a car crash, and exploring both strands, but really, I’m a crime writer and I wanted to write novels with that interesting criminal/legal element. I had been trying to think around the idea of a Sliding Doors novel. I was putting the bins out one night and, and I reached down to pick up a piece of rubbish that had rolled out of the bin bag, I thought: Sliding Doors plus crime. I left that thought alone and, the next night – in the middle of the night – I woke up and thought about a woman who hands herself in and leaves the scene of a crime. Anything You Do Say was born at half past two in the morning. 5.) If you were your main character Joanna which path would you choose? Definitely Reveal. I am very law-abiding. Waiting to get caught would actually be worse than getting caught, for me. 6.) Was writing a second novel harder or easier than writing the first? Both. It was easier because I knew I knew how to do it. It was harder because Anything You Do Say was so ambitious – it is the longest novel I have ever written, and what I didn’t realise when I had the initial idea was that there would be double the character development. In each strand, Joanna’s husband, best friend, brother and parents have totally different character arcs. At one point it felt out of control and sprawling. Luckily, I wrote it before my first novel was published, so I never felt the weight of the readership (that came later). 7.) Do you have any advice for aspiring thriller writers? Finish a draft. It’s as simple – and as difficult – as that. Sit on the chair, most days, until it’s done. 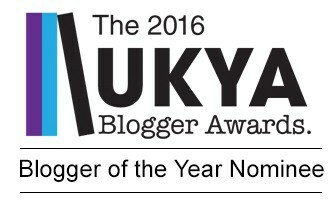 This is the biggest hurdle - I have observed - that aspiring writers fall at. I did, too - for years. 8.) 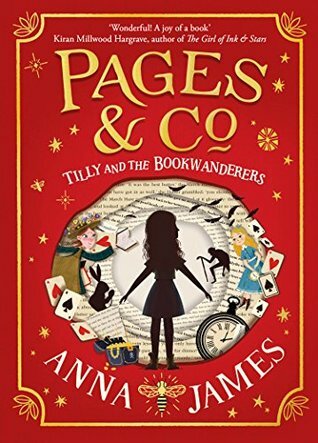 What books would you recommend to fans looking for similar stories to your own? Interesting question. Imran Mahmood writes in the crime sphere, though is more literary than me. Jodi Picoult and Liane Moriarty both occupy (brilliantly) the Venn diagram where women’s fiction meets crime. 9.) Can you tell us a bit about what you’re working on next? Of course. I have just delivered my third novel, No Further Questions. It’s about a woman who looks after her sister’s eight week old baby overnight. The baby dies, in somewhat suspicious circumstances, and she’s accused of manslaughter. It’s a courtroom drama, and it was an absolute joy to write. 10.) And finally, what three words best describe Anything You Do Say? Thank you for stopping by the blog today Gillian! 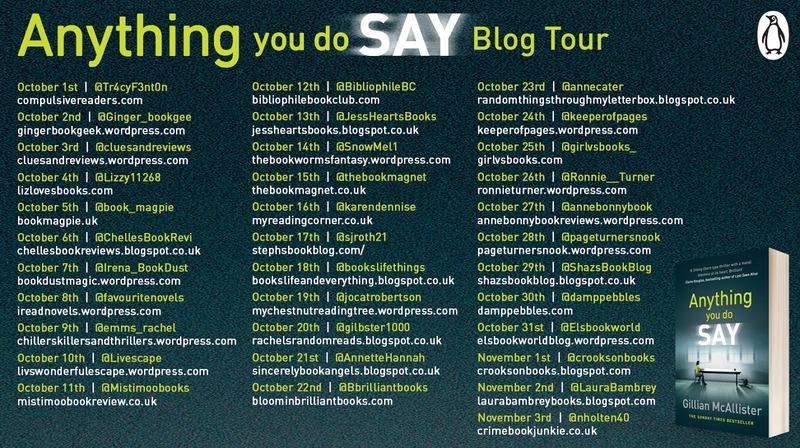 For more fantastic posts don't miss the rest of the blog tour!